Laura Wells (left), with Ajay Bhai Amrit. This week we look at a woman who is making great strides in both the glamorous modelling industry and who is an activist for conservation and the environment; her name is Laura Wells. Laura is a very well known plus-size model in both Australia and the UK; she has been an international model for a number of years now and is an avid believer in positive body image. She is a very curvaceous and striking looking individual who models as a perfect size 14. When I asked Laura about being an international plus size model, she felt that trying to be a size zero or a size six etc is not necessary and that full figured women are more of a norm in society. She also commented that women in general are sizes between 10 and 16. As well as being a very sought-after model, Laura is also an environmental scientist who has a passion to protect the oceans and its wildlife. 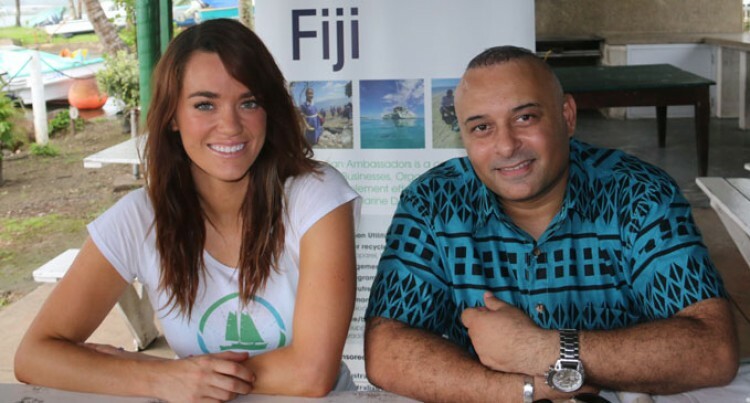 Laura is a member of “Ocean Ambassadors” who through the help and funding of a Direct Aid Programme by the Australian High Commission have dropped anchor in Fiji to spread the message about the environment. One of the programmes that Ocean Ambassadors are carrying out currently is called “Fast Track Fiji” where schools and the local community can get involved and collect all waste including plastic bottles and containers and wrappers, etc, and have them recycled. Plastic is notoriously slow to break down and decompose and can take hundreds of years in some cases to be completely bio-degraded. With the help of this programme Laura and her colleagues have been interacting with school children and university students on the harmful effects of waste that finds its way into are oceans. Surprisingly we are all linked in this fight to save our environment, for example a person in Japan or America can dispose of their waste in the sea thousands of miles away in their ocean and that same waste could be washed ashore in Fiji after a short period of time. Australia and New Zealand who are so much closer have the same predicament. And waste from Fiji could end up on their shores and vice-versa, so we all have a responsibility at the very least to be responsible citizens and dispose of our waste sensibly. So many times on a drive from Suva to Nadi I personally have encountered people throwing bottles and plastic bags out of their car windows with no respect for the environment as they continue to pollute our coast- line without thinking of the consequences. Laura is a welcome addition to a dedicated team of environmental warriors who through interaction and education programmes are slowly but surely making all of us more conscious and aware of our environment and how to look after it. With her vast knowledge on environmental science and passion to share and educate the masses on this important subject Laura is certainly a woman of action. When I asked her which occupation was more important to her, modelling or being an environmental scientist there was no contest.